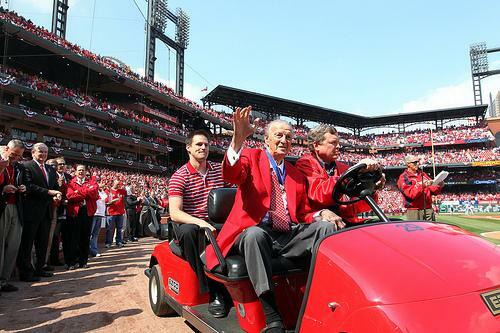 Stan Musial on Opening Day 2011. Stan Musial, one of baseball's greatest hitters and a Hall of Famer with the St. Louis Cardinals for more than two decades, has died. He was 92. Greg Echlin reports for St. Louis Public Radio on the life and legacy of Stan Musial. The Cardinals announced Musial's death in a news release. They said he died Saturday evening at his home surrounded by family. 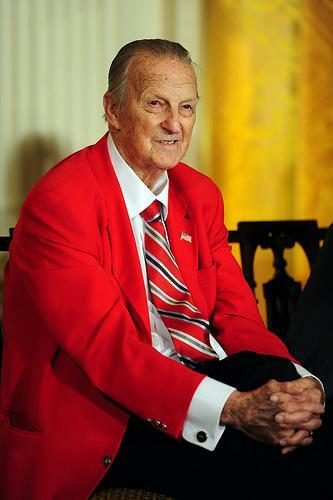 In that statement, chair Bill DeWitt Jr. called Musial the "most beloved member of the Cardinals family." Musial was so revered in St. Louis, two statues of him stand outside Busch Stadium. He spent his entire 22-year career with the Cardinals and made the All-Star team 24 times — baseball held two All-Star games each summer for a few seasons. 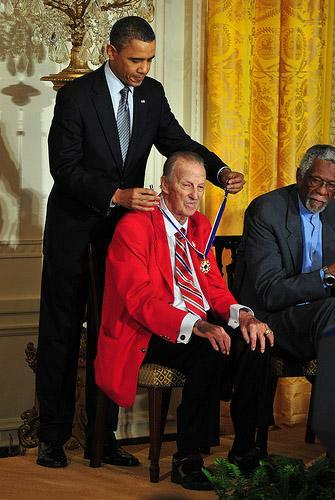 In 2011 Musial was awarded the Presidential Medal of Freedom by President Barack Obama. Audio of remarks made by President Obama during the ceremony is below. "Stan Musial was a national treasure that St Louis was happy to share. No one was more deserving of the love and respect that all of us had for the man, our man, Stan the man, Stan the gentleman. We all send our sympathy to the entire Musial family. There will never be another one like him. Heaven is now home to the perfect swing, the ready smile, and some darn fine harmonica tunes." "Stan Musial was not only the ultimate Cardinal, he was as good a man off the field as he was on the field. I was honored to join Stan and his family at the White House as President Obama awarded him the Presidential Medal of Freedom, our nation's highest civilian honor. Stan Musial brought honor to the Cardinals, to our city and to our nation. I join with all Cardinal fans as we mourn his passing and I extend my deepest sympathies to his wonderful family. I will always remember going with my Dad to Sportman's park to see "Stan the Man" play. #6 will live forever in our hearts." In St. Louis, Mayor Francis Slay ordered flags to half-staff, and said he and his wife expressed their condolences "on behalf of generations of St. Louisans." "St. Louis has lost not just baseball's "perfect knight" but also its own favorite son. No figure in St. Louis history has been more greatly or deeply admired than Stan Musial. None has brought more joy to more citizens over more years. No one will be more widely and deeply mourned. There's hardly been a child born in this city since 1930 who doesn't know to whom the No. 6 belongs. It belongs to The Man -- and what a good man he was." Funeral arrangements have not yet been announced - an earlier report from the St. Louis Post-Dispatch that the services would be Thursday was apparently incorrect. The family has asked for donations to be made to Covenant House or a another charity in lieu of flowers. 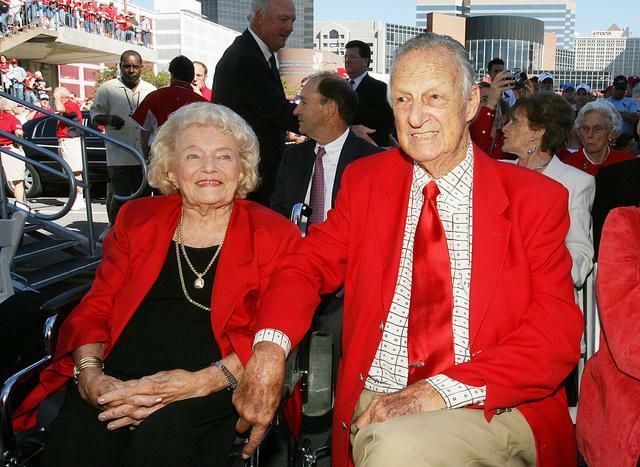 Musial's wife Lil died in May 2012 - they had been married for 71 years. He is survived by four children, 11 grandchildren and 12 great-grandchildren. St. Louis Symphony Conductor Laureate Leonard Slatkin returned to St. Louis this week to conduct the orchestra he led for 17 years. Slatkin was Robert Peterson's guest during the intermission of St. Louis Public Radio's live broadcast of the St. Louis Symphony concert on Saturday, January 19. 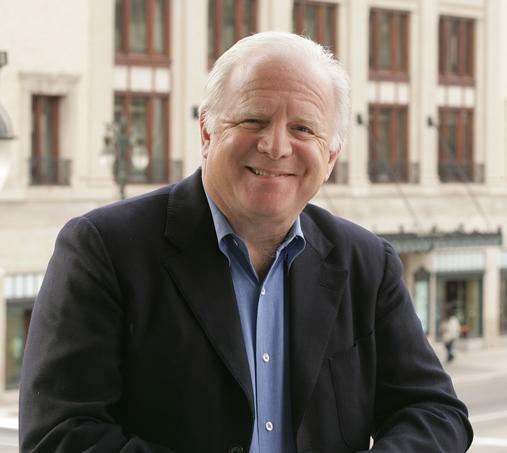 During the conversation, Slatkin commented on building audience for the St. Louis Symphony to make it as well known as the St.